The World Council of Churches has rebuked North Korea's early January nuclear test, urging the reclusive State and other nations to help reduce tension and promote negotiations for an end to its suspended state of war with the South. The United States flew a B-52 bomber over South Korea on Jan. 10 in a show of force as North Korean leader Kim Jong-Un insisted his country's latest nuclear test was carried out in self-defense. Following the nuclear test conducted by North Korea, the WCC is calling on all parties involved in the current situation on the Korean peninsula to engage in peace-enabling actions. It singles out especially South Korea, North Korea, the USA, Japan and China. The WCC calls on all of them to "invest in initiatives to reduce tensions, to promote dialogue and to encourage negotiations for an end to the suspended state of war." It has been 63 years since the cessation of fighting between the two Koreas, but that was due an armistice signed on 27 July 1953 thus bringing an end to the Korean conflict. WCC general secretary Rev. Olav Fykse Tveit these countries should do this to enable "peaceful co-existence on the Korean peninsula, rather than measures that increase the risk of catastrophic conflict." "As a global fellowship of churches committed to a pilgrimage of justice and peace, we seek hope-inspiring alternatives to the deadly cycle of provocation and military confrontation," he stressed. On Jan. 5, reports of an unusual seismic event close to a known nuclear test site in North Korea (Punggye-ri) were followed by official television statements that North Korea had successfully tested a hydrogen bomb. 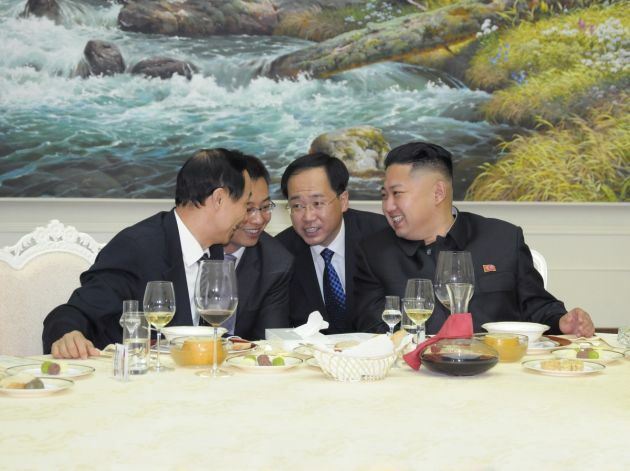 North Korea warned of war as South Korea on Jan. 9 continued attacking anti-Pyongyang propaganda across the rivals' tense border in retaliation for the North's purported fourth nuclear test, The Associated Press reported. The WCC said that for more than 30 years it has engaged in opening doors for encounter and dialogue between North and South Koreans, and in promoting and supporting this relationship. 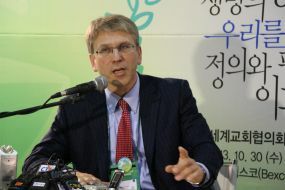 Peter Prove, director of the WCC's Commission of the Churches on International Affairs said that, "more than 70 years after the division of the peninsula, Korean people continue to be separated by the most highly militarized confrontation in the world. "The vision and dream of peace is threatened by any and all measures that heighten rather than reduce tensions in this dangerous situation." Tveit noted, "The WCC also has a long history of principled opposition to nuclear arms, and supports the recent 'humanitarian initiative' towards a global legal ban on such unconscionable weapons of mass destruction." On the Korean peninsula, the threat of nuclear conflict jeopardizes the lives and future not only of the people of the peninsula but of the wider region and the globe. "Therefore", stressed Tveit, "the WCC condemns initiatives to scale up the destructive potential of nuclear weapons on or in the vicinity of the Korean peninsula." He said that that WCC governing bodies have repeatedly called for a nuclear-free Korean peninsula, for the complete, verifiable and irreversible elimination of all nuclear weapons in North East Asia, and for a global humanitarian ban on nuclear weapons. Prove said, "Current or envisaged responses to the recent nuclear test by North Korea do not lead in the direction of de-escalation and dialogue. "Such troubling responses include today's resumption of loudspeaker propaganda broadcasts by South Korea, the possible strengthening of economic sanctions, and increased international military presence (including nuclear-armed forces) in the region."